WEST HARTFORD, CT- The Hartford Hawks hosted the Binghamton Bearcats Sunday afternoon at the Reich Family Pavilion Auxiliary Gym and after pulling out to a 2-0 set lead, found the Bearcats coming back to tie the match at 2-2. Set 5 proved to go largely the Hawks way and Don Ferguson’s squad picked up a rare win over Glenn Kiriyama’s Binghamton program. Set 1 was a back and forth until Hartford was up 14-13. The Hawks then went on a run to pull ahead to 19-13. The two teams traded points but this was to Hartford’s advantage. With U of H up 24-19, the Bearcats picked up two more points, before Hartford picked up the set win 25-21. Offense for the Hawks included a kill from Michelle Cordell, a great save by Jackie Tamburri kept the ball alive and eventually Binghamton attacked into the net, later Lindsay Anderson had a light tip in, Kami Nethersole struck from the net, Anderson added another kill off a Bearcat and over the scorer’s table. Tamburri used a fake set attack successfully, and Kami Nethersole struck again, Tamburri and Cordell picked up a block, Kami Nethersole had 2 more kills, Sareeta Nethersole added a rocket, Anderson and Kami Nethersole had a block, and Cordell smashed the ball off the blockers. 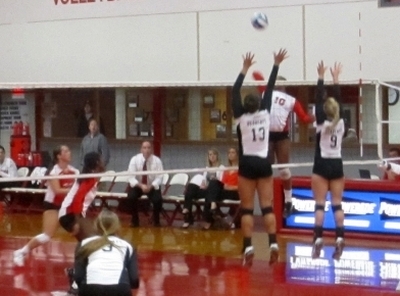 During another Hawks runs following two BU errors, and a kill, Anderson had a solo block, and Taylor McCreery sent a kill through the block, Sareeta Nethersole had a pair, McCreery had another kill, and the Hawks picked up another point following a great save by Danielle Etta, and eventually Kami Nethersole used a tip. The set would end on a long rally, where Etta had another key save and the Bearcats committed an attack error. Binghamton offense included a kill from Grace Vickers, Kristin Hovie added a kill not long after, and Alex Roland and Annelot Nieuwenhuis added to the point totals. Xiomara Ortiz served up an ace, and later Nieuwenhuis added another kill, Vickers hammered an attack over, Amanda Dettman set the ball to Vickers and she smashed it over, her teammate Roland sent a hard spike over as well. Roland would later hack an errant Hartford set over for another point. She had a tip later, and Vickers smashed a kill in, later Hovie had two kills in rapid succession, late in the set, Roland added another kill, and Julie Chambers had a block. Set 2 opened to a 10-10 tie, but Hartford started to roll, picking up a 14-10 lead, and then a 17-12 lead, only to have Binghamton close to 19-17.The two teams traded points until 21-19, but Hartford did all the scoring for the rest of the set to close it out. Binghamton’s offense consisted in part of a kill from Vickers, a block from Hovie, Roland had a kill, Dettmann fed Vickers who positively smashed the ball, later they repeated the maneuver, Hovie launched a rocket, and another kill, and not long landed another kill in bounds, Roland picked up another attack just inside the lines, and Hovie added another kill, Nieuwenhuis struck twice in succession, and Viickers added another to her growing total. Offense for the Hawks included a kill from Kami Nethersole early and one from sister Sareeta, a few points later Tamburri sent one to Kami Nethersole who dispatched the ball with great effect, Sareeta Nethersole and Anderson shared a block, later McCreery typhooned a fast kill into the Bearcat zone and Sareeta Nethersole and Cordell had a tandem block. They would each have a kill as well. McCreery sent a kill off the blockers and down, and Tamburri had a kill, she then set it to Anderson who spiked it. Kami and Sareeta Nethersole each added kills and the Hawks benefited from Bearcat attack errors for the win. In the battle royale that was set 3, Binghamton and Hartford needed extra points to settle things with the Bearcats eventually picking up the 29-27 win. The Hawks reached a 14-11 lead, before the Bearcats stormed back to a 15-14 lead of their own after a fierce set of exchanges the score reached 19-19 and Hartford pulled out to a two point lead only to have the Bearcats even it up 21-21. Hartford snagged a 24-22 lead and with the set and match on the line couldn’t close it out with Binghamton emerging to a 25-24 score of their own. Hartford tied it up but the two teams kept battling until the Bearcats closed it out. For the Hawks scoring came from Tamburri’s tap attack, a block from Anderson, a spike from Sareeta Nethersole, and Kami smacked a kill off the Bearcat block and down, a few points later Tamburri set a ball over the opponent’s couldn’t return, Cordell had a cross court kill, and their 13th point came from Anderson picking up a huge smash, which the defense had little chance to return, Kami Nethersole struck again, Anderson sent the ball into a corner, Cordell used a light touch, and she had a tandem block with Tamburri. She would also added another kill right through the bock, Kami Nethersole would have a two more points for the Hawks, and later another,. Anderson and Sareeta each struck again before the set ended. In the set win the Bearcats scored in multiple ways including Vickers continuing to be a big threat with two early kills, Hovie had a block, and later a kill, Nieuwenhuis scored another kill, following a defensive save from Dettman, she set the ball to Vickers who spiked it in, she then stepped back and served up an ace, Roland added a tap attack, and a few points later teamed with Hovie on a block. When a Hawk dig sailed over the net Hovie sent it back. Roland battled a Hawk at the net and won the joust for another kill. Late in the set as they each went back and forth Nieuwenhuis had a cross court kill, later Hovie took the lead with a kill off the defenders, she sent the ball to the gap to tie the score at 26. Roland had a kill, a tandem block with Nieuwenhuis, and another kill to end the set. In set 4, the two teams battled to 13-13, but Binghamton took a lead of 20-17. The Hawks closed the gap to 21-22, but Binghamton held on to a 25-23 set win to even it up. Scoring wise for Hartford, Kami Nethersole opened up the set with multiple kills, Sareeta Nethersole had a kill, and Kami added two more of varying types, later Tamburri had a block stuffing an attack, Sareeta smacked one off the blockers, Cordell launched a whap from back court which bounced off a defender, Anderson added another huge smack, Cordell had a block, and then teamed with Tamburri on another, a few points later she unleashed a massive spike, and then served up an ace, Kami Nethersole had the last direct kill U of H would have in the set as well. For Binghamton Roland had a kill off the blockers, Ortiz served up an ace, later Nieuwenhuis had two kills in short order, and Vickers struck again, Hovie launched one, and to tie it up at 10 Roland picked up a spike, Dettman set it to Vickers and Nieuwenhuis had 3 more kills for BU to give her team a two point lead. Vickers and Nieuwenhuis each were not stopped by the blockers as the lead built to 4, Vickers had two more points in short order. Late in the set it would be Roland picking up 3, and Ortiz served up another ace. Chambers and Vickers then shared a block to end the set. With the Bearcat comeback the 2-0 set advantage had been erased and it all came down to set 5, a whole new ballgame for both teams. Roland got the visitor’s on the board with a kill, and then Vickers and Chambers shared a block, but following a long rally, Cordell walloped it home, and Kami Nethersole used a light touch, Cordell then served the ball and it was not returned, and she had another serve go unreturned immediately after, Kami Nethersole was not stopped by the block attempt and Hartford lead 5-2. The Hawks picked up 3 more points thanks to a pair of attack errors by the Bearcats surrounding another Kami Nethersole kill. The Hawks were perched at an 8-2 lead but the Bearcats made it interesting fighting back with an 8-4 run, during which Nieuwenhuis struck multiple times, as did Roland. Kami Nethersole added another kill during this time and the Hawks benefited from attack errors. Roland would have the 10th point of the set for the Bearcats and spur a Hartford time out. When play resumed Sareeta Nethersole had a kill but Roland responded, Tamburri then picked up a kill to keep the lead at 3. Roland again added a point, but Kami Nethersole ended it 15-12. For Binghamton, Roland had 22 kills on the day (many clearly at key times.) and a .340 hit percentage, Vickers had 16 and a .323 hit percentage, and Hovie 14, and Nieuwenhuis had 13. Dettman picked up 56 assists, and the libero Ortiz had 21 digs, though Dettman had 14 as well. Ortiz also had 3 service aces on the day, and Vickers 1. Roland had 2 solo blocks and participated in 6 total. Vickers had 1 solo and participated in 3 others. Hovie was a part of 5 blocks as well. The Bearcats had 36 attack errors on the day. For Hartford, Kami Nethersole not surprisingly had 26 kills on the day, Sareeta Nethersole had 14, and Cordell 11 and .300 hit percentage, McCreery had 7, and Anderson 6. Tamburri had 56 assists on the day as well. Etta had 19 digs as well as a variety of key defensive saves, and Sareeta Nethersole had 20. Anderson had 2 solo blocks and shared another, Tamburri had her solo block and took part in 2 others. Cordell was part of 3, and Sareeta Nethersole was part of 2. Cordell had 3 service aces on the day, the only ones the Hawks had. The Hawks had 20 attack errors throughout the match. Hartford is now 11-12 and 2-4 in the America East (though both wins were against teams they rarely have beaten.) Binghamton is now 10-13 and 2-4 in the America East though they knocked off America East co-leading UNH on Friday. Editor’s Note: This is based on notes taken at the match, verified against the official play by play if possible. Reports focus on offense since it is easier to track but note defensive play whenever possible. It is difficult to note things like digs and assists although they are no doubt vital to the game. Also, a lot happens in a volleyball game, far more than can fit into a report, so this just notes some of it.